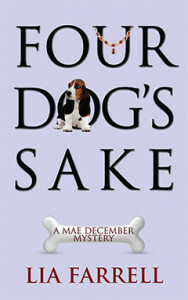 Four Dog’s Sake ($14.95, 262 pages, ISBN: 978-1-60381-246-7) is the fourth cozy mystery by Lia Farrell in a series featuring Mae December, the successful owner of a dog boarding business in Rosedale, Tennessee. When a dying man’s son is killed, Dr. Lucy Ingram, her friend Mae, Sheriff Ben Bradley and his staff look for answers in the father’s last will and testament. 4 Stars: “The author does an amazing job of character development. There are a lot of players in this story but they are all interesting and it takes all their skills to determine Chester was murdered and who the killer was. I found myself caring about them all. I even enjoyed Mae’s four dogs…. The author stayed ahead of me. I had one suspect, then another. It isn’t until the very end you get the motivation of the killer. This is a fast paced cozy that keeps your attention all the way through. I’ll be watching for more in this series.” Read more…. “This 4th book in the Mae December series is a delight to read. An eclectic cast of characters take a murder mystery on an interesting spin making for a humorous and adventurous mystery. The icing on the cake is the adorable dogs.” Read more…. “There are many threads to this mystery, many characters to keep track of (though the author does a good job of guiding us along), many clues and leads to follow, and many loose ends, all the way to an interesting conclusion. The end of the story is one that some clever and attentive readers may puzzle out well before the last page, but probably not…. Four Dog’s Sake is a good, easy read, of an evening or two, while sitting with your own favorite dog by your feet.” Read more…. 4 ½ puppies: “Four Dog’s Sake was well written and no easy task. The authors clearly stated when another point of view was given. There was no trying to figure out whose head you were in. The storyline’s progression was paced appropriately, never slowing down. You could easily relate to the characters and were concerned about their well being and their abilities. You really didn’t know the guilty party until the very end.” Read more…. On a hot, humid July 4th evening in Rosedale, Tennessee, a young man is dead on arrival at the hospital where Dr. Lucy Ingram works. Lucy recalls the affable young man, Chester Willis, from an earlier visit. The death is pronounced a suicide from an overdose of the insulin used to treat his diabetes, but Lucy isn’t convinced. The man just wasn’t the suicidal type. She pushes for another autopsy, and they find an injection site proving that someone else administered the deadly dose. Later in the week his ailing father dies as well. Now there is the matter of the father’s will. Who stood to benefit if Chester was taken out of the equation? The easy answer is Chester’s brother Rick, who is in debt and has an expensive fiancée. Then there’s Brooke, the struggling massage therapist the old man befriended. The will has made her a wealthy woman. Sheriff Ben Bradley and Lucy’s boyfriend Chief Detective Wayne Nichols are on the case, along with newly appointed investigator Dory, Ben’s girlfriend Mae December, and the rest of Ben’s office staff. Soon they must accept that there will be no easy answers. The heat has tempers flaring, and Wayne, Ben, and Mae are distracted: Wayne by his changing relationship with Lucy and by having to cope with dark episodes from both their pasts, Ben and Mae by his reelection campaign and the couple’s upcoming wedding. Then there is Cupcake, the new basset hound puppy owned by Ben’s son Matthew, who becomes the fourth canine to take up permanent residence at Mae’s house. Mother and daughter writing team Lyn Farquhar and Lisa Fitzsimmons live in Michigan and Tennessee respectively. Both are life-long readers who are also dog lovers. Lisa works as a Muralist and Interior Designer and her mother, Lyn, is a Professor of Medical Education. Click here to find them online. The series will continue in 2016. “What the hell?” Lucy said aloud. She shared the office with other doctors, but there was no one else there in the wee hours to hear her outburst. Something about this wasn’t right. She checked her tablet computer for her notes on Chester Willis’ visit for the chainsaw injury. There it was: “Brittle diabetic, no known history of alcohol or drugs. Knowledgeable about his condition.” She had spent over twenty-five minutes stitching Chester up, during which he displayed no signs of depression. He was the last guy she would have suspected of being a suicide risk. She quickly wrote an email to Dr. Estes saying she had some questions and would be stopping down to see him about Chester Willis. As her finger was about to hit “send,” she hesitated, knowing that the email might come across as challenging the ME’s declaration on nothing more than her intuition. She had no evidence, but her gut said that something was very wrong about Chester Willis’ cause of death. She knew that patients lied to her, putting on a front to hide depression or saying they were not drinking or doing drugs when they were in fact using. But not Chester Willis. He had been looking forward to his remaining time with his father. She had seen insulin injection marks on his thighs when she stitched up his injury, but they were in a tight pattern—as diabetic injections should be. Chester had worn a short-sleeved shirt and shorts to the ER, and Lucy hadn’t noticed any needle marks on his arms, where recreational drug injection marks would typically show up. Baffled, she hit “send” on the email and then quickly called her boyfriend—Wayne Nichols, Chief Detective of Rose County. “Nichols,” his sleepy voice said.